Many media outlets and multiple press reports plus posts on Facebook are describing a developing disaster scenario on Nanga Parbat for Polish climber Tomek Mackiewicz. He and his French climbing partner Elisabeth Revol were on their summit bid in a tiny weather window when Mackiewicz developed frostbite and snowblindness. There has also been a mention of injury, but that is unclear. Horribly sad but also part of mountaineering for a winter 8000er, due to impending bad weather the rescue efforts for Nanga climber Tomek has ended. The K2 climbers who stopped their historic effort for a winter K2 summit will descend with Elisabeth Revo – one life saved. I will have a full recap and what’s next tomorrow. Amazing effort and well done to all. RIP Tomek. We are witnessing a superhuman effort by the K2 team to climb so fast at night. There are only a handful of climbers who could be doing what is happing before our eyes. They climbed at a rate of 400 feet or 121 meters per hour at 20,000 feet/6000 meters up a very steep, icy and technical Kingshofer wall. This is simply incredible. Other K2 climbers will continue to try and reach Mackiewicz . He was last reported at 7200 meters but there has been no recent contact with him. If you are accessing any SPOT or other GPS trackers for Nanga Parbat, a request has been made to stop as it is taking up bandwidth, delaying information and preventing access at times. Thanks. Not important now, but there is a report both Revol and Mackiewicz did summit Nanga Parbat on the 25. – not confirmed. The fundraiser target has been increased to help with more expected expenses. The K2 climbers are now on Nanga Parbat. The helicopters are waiting for better weather before flying to K2 base camp thus delaying the attempt to help those on Nanga. 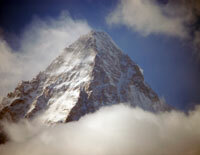 If the K2 team cannot be reached four high altitude porters will be helicopter to 6300 meters to render aid. Revol has been in contact and reports frostbite but she seems to be surviving. – Eli managed to bring Tomek down to 7280m this morning and set him up in a tent to spend the night while the rescue effort gets under way early tomorrow morning. – Eli is in the process of descending down and has last communicated from 6671m. Though she has no tent, she is clearly lucid and is making progress on descent to help get rescue effort under way. – K2 Polish climbing team of 4 will be picked up tomorrow from their base camp by a helicopter to mount a rescue attempt from the base camp of Nanga Parbat. – Your generosity and the help of Ministry of Foreign Affairs of Poland has helped fund the effort. A rescue plan was developed when the Polish K2 team agreed to fly to his location around 7,300-meters. They are already acclimatized to this altitude from their efforts on K2 and are the only viable team available on earth. Also, Polish climber, Adam Bielecki knows Nanga well since he attempted it by the same route in the winter of 2016. Ciao Matteo. Everything is in correct way finally. Tomorrow morning rescue team will fly to Diamir. We will try to go by Kinshoffer route as soon as possible. Adam and me are in head-team, going light style. Will be necessary to climb, sure, because old ropes shall be into the ice. Our group can be 4-6 members finally. We’ll try to do our best. The commercial company, Askari Aviation flying a Pakistani military helicopter, refused to launch the mission without $100,000 rescue costs guaranteed. This is standard procedure in Pakistan. Mackiewicz doesn’t have insurance but Revol does. The government of Poland stepped into secure payment but two crowdfunding efforts, crowdfunding 1 / crowdfunding 2 have already raised over € 80,000 within hours. Two helicopters, standard on Pakistan, will conduct the operation. First, they will pick up K2 climbers, Denis Urubko, Adam Bielecki, Piotr Tomala, Jarek Botor and Marek Chmielarski, Saturday morning then fly to Nanga which is 111 miles from K2 – about one hour flight. UPDATE: Several reports have the helicopters have left Skardu to pick up the K2 climbers but unconfirmed. Given the location of the climbers, the helicopters will drop off the rescue team around 6,000-meters and they will need to climb up the Diamer Face to aid the climbers. They will attempt to rescue Revol first who is reported to have tried to descend to a safer altitude near Camp 3. She has sent her GPS location via her SPOT tracker. Then they will return to attempt to retrieve Mackiewicz near Camp 4, suggesting he will be spending over 48 hours stranded. The weather was forecast called for bad weather on K2 starting on Friday, so there is a question if the rescue team will even get an opportunity. Sending my best is this dire situation. It costs 100,000 dollars for a helicopter ride from Skardu to K2 to Nanga (and back)??? Or is this just the Pakistani Military exploiting a desperate situation? Hard to say, but in polish mountains 1 hour of rescue helicopter flight cost around 3000 euro (~3700 dollars). So this kind of operations are not cheap.